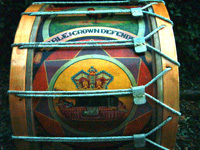 In summer evenings and especially on the ‘Twelfth’ the sound of the lambeg drum echoed around many parts of Ulster. The sides were made of goat skin and tightened by ropes. Even big drums like the one in the photograph were surprisingly light. When beaten with slappers, flexible cane rods, they produced a very loud sound.